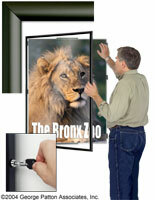 This high quality poster case allows you to change your 24" x 36" signage with ease. 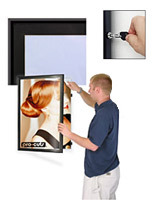 The satin black aluminum framing gives your prints a very professional look and will focus the attention of your customers and employees to your advertisements. 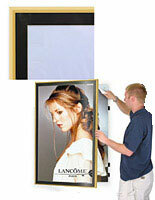 This poster case features a strong and lightweight acrylic cover to protect the displayed items. 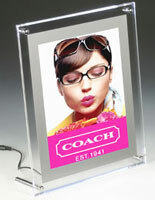 Each frame comes with reusable adhesive tape for holding signs to the backing board. 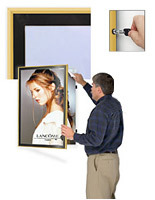 The door on this poster case will overlap your poster by 1/4" on each edge. 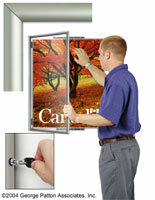 A plunge lock provides security when the frame is closed. 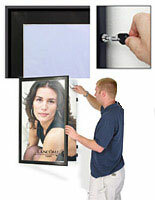 The backing board is permanently affixed to the inside of the poster case and can accommodate signage up to 1/16" thick. The overall size of this unit is 25 1/2"w x 37 5/8"h x 1 1/4"d. The rounded aluminum outer frame is approximately 1" wide on each side. 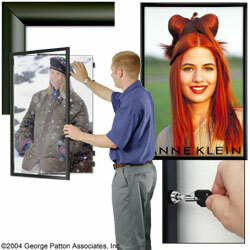 This poster case comes fully assembled and ready to mount on your walls. 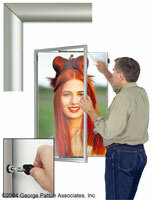 This product is designed for interior use only. How are these different from our economy and contemporary poster displays? Please Note: Lead times vary by order quantity. Please call our Contact Center for estimated lead times for orders of more than 7 units. 25.5" x 37.6" x 1.3"